Planning on building a deck this spring? Here is helpful information about how and where to start planning you dream deck. Brent describes four tips to designing your next decking project in the winter months so that you can enjoy your outdoor deck during the summer months. Brent Gwatney is Senior Vice President of Sales and Marketing for MoistureShield composite decking. With the days getting shorter and temperatures dropping, you might be inclined to cozy up beside a warm fire and not think much about your outdoor living space. But, those long hours indoors are the perfect opportunity to research and plan your next deck project. Once spring rolls around again, you’ll be ready to make your dream a reality. how To Start Planning your dream deck? To achieve an outdoor living space you’ll love, let your imagination roam freely. Consider how your hobbies and interests can influence your deck’s design. 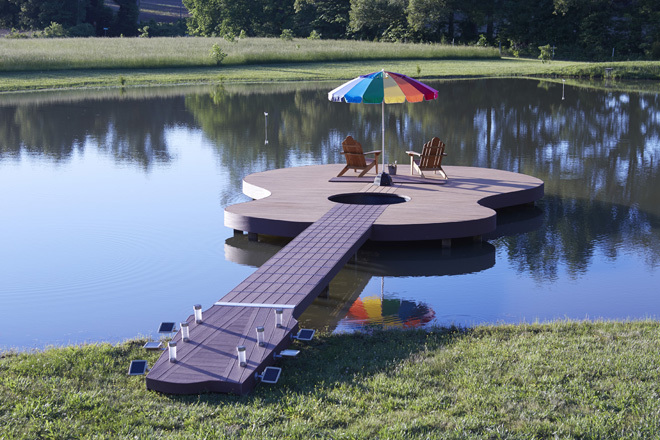 Music lovers Stephanie Brown and Rick Street did just that when they dreamed of a deck shaped like a giant version of Stephanie’s classic, six-string acoustic guitar. Their one-of-a-kind “Guitar Deck” in rural Illinois is so visually unique, it has its own Facebook page with nearly 1,000 followers. Even if you don’t go as far as something like Guitar Deck, you don’t have to be limited to a rectangular deck. 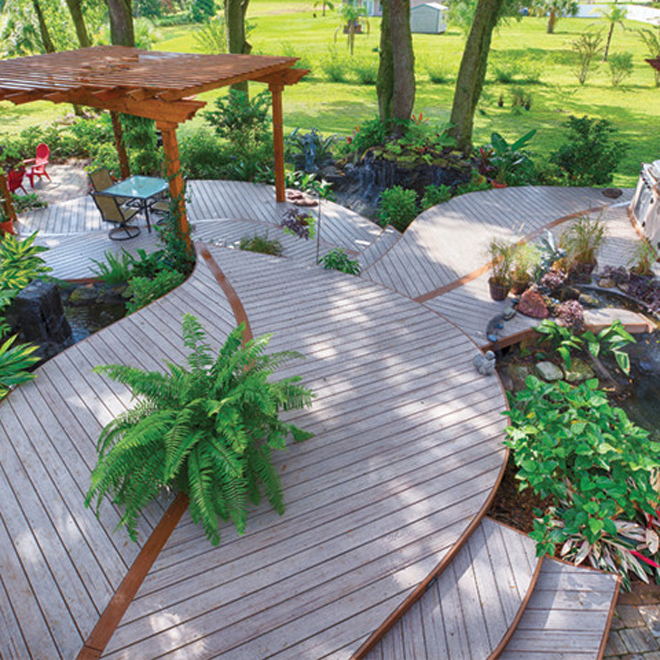 High performance products like composite decking can be curved to form any number of interesting shapes, encircle a tree near the deck, or frame a garden, providing continuity between deck and landscaping. To help envision the possibilities, check out creative decks shown on social media. Deck manufacturers like MoistureShield composite decking showcase many innovative designs by deck builders and homeowners on their websites, Pinterest and Houzz pages. 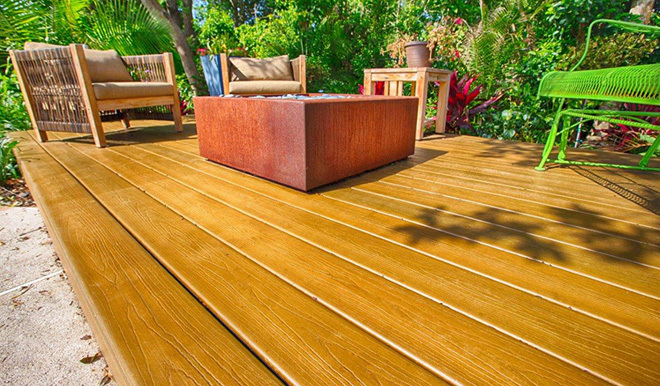 A few decades ago, decking choices were limited to simple wood species like pine, cedar and redwood. 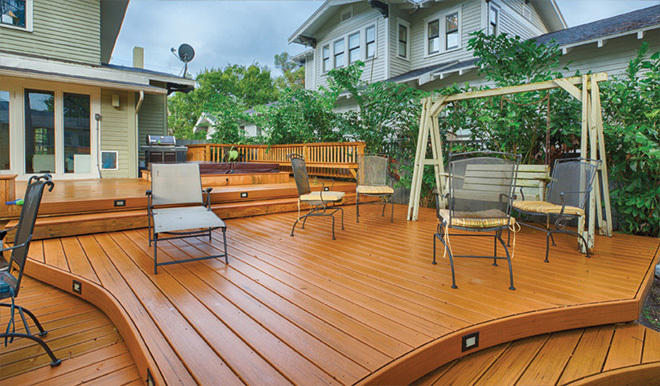 Today’s deck builders and homeowners have a multitude of decking choices ranging from luxurious hardwoods to PVC alternatives. The fastest growing among these are wood-plastic composites. The most advanced composites offer a rich, warm look with realistic wood-grain details, and resist moisture for long-term durability. They also reduce the hassles of deck upkeep by eliminating the need for annual painting, staining or sealing. To get a good feel for the latest decking options, visit your local lumber yard, where you can see and touch a range of deck board styles and colors. Your local building material dealer can also discuss the choices with you and explain which materials are popular and perform best in your area. As you’re developing the design for your dream deck, it’s important to remember to check in with your local building department regarding any required building permits. 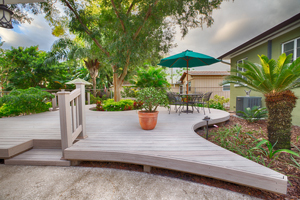 Typically new construction, additions or modifications to your deck will require a permit. Requirements vary based on which edition of the International Residential Code (IRC) your local jurisdiction follows. Design requirements might address board spacing, the size of deck joists, fastening methods, where railings are required, spacing of railing balusters, and other design and material factors. In essence, the code helps ensure your deck is safe by making sure it is able to support the loads placed on it and has adequate railings to prevent falls. Getting a permit not only helps ensure a safe design, it also keeps you out of trouble with your local government and keeps you in compliance with your homeowner’s insurance. With your deck design in hand and confirmation that it will meet local code requirements, it’s time to figure how much decking and railing you’ll need. If you’re working with a deck building pro, they’ll handle that, but if you’re a DIYer, your local building material dealer can develop the material take-off list for you. This list will detail how many boards are needed (by length and width), how many posts, rails and balusters are needed, along with the amounts of structural elements such as support posts, beams and joists. Whether you live in a dark and stormy climate like most northern areas of the U.S., or enjoy a more temperate subtropical area along the country’s southern tier, winter limits your outdoor living time. But, those long hours indoors provide the perfect opportunity to get ready for many months of deck time fun in the coming spring, summer and fall. 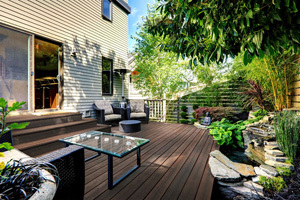 Be prepared for deck season: Plan your dream deck Now! 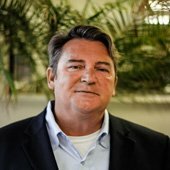 Brent Gwatney has specialized in the building industry for more than 30 years, working with manufacturers, dealers, design professionals, contractors, and building officials.